No time, no time. Gotta get back to the Movies Of The Year, but I want to catch up with these first. So we’ll try to get through this as quickly as possible. 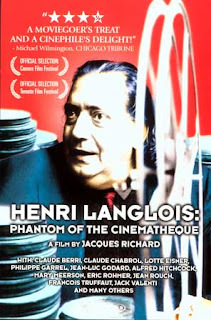 Henri Langlois: Phantom Of The Cinematheque – I really loved this documentary about the founder of the great Paris movie theatre who more or less invented the rep theatre, film preservation, laid the groundwork for the French New Wave and the auteur theory and caused riots in the streets of Paris when he got fired. Lots of great talking heads, and some fascinating archival footage. Highly recommended for anyone with an interest in repertory cinema. The #9 film of 2004. The Big Steal – Fun adventure noir with Robert Mitchum and jane Greer chasing money and being chased in turn in Mexico. Directed by Don Siegel, it’s got an impressive car chase for the 40s, very fast. The #15 film of 1949. Topaze – Mediocre comedy/drama about a naive teacher caught up with amoral rich folks after getting fired. John Barrymore’s great, Myrna Loy;s alright, Ben Hecht wrote it, and it was directed by Harry d’Abbadie d’Arrast, which sounds fake but apparently isn’t. The #5 film of 1933. Bad Day At Black Rock – Well-above average for a 50s social problem film, with Spencer Tracy as a vet investigating the murder of a local Japanese farmer during WW2. The whole town’s involved in the cover up, led by Robert Ryan in another fine performance. Considering the KKK was still doing this kind of thing at the time, and the film’s relative lack of preachiness, it’s pretty impressive. Directed by Don Siegel. The #10 film of 1955. Tower Of London – Roger Corman and Vincent Price tell the story of Richard III without all the Shakespearean poetry. Fine as far as it goes, and Price is a good Richard. The #19 film of 1962. Odd Man Out – Carol Reed when he was still great. Lots of blacks and shadows and noir in Dublin after IRA agent James Mason kills a guy, is wounded and has to make his way out of the city with entire British Army after him. An improvement on John Ford’s similarly themed The Informer. Mason’s outstanding. The #5 film of 1947. That’s Entertainment! 3 – MGM’s documentary about it’s own musicals. Lots of fun clips, lots of stars, fun, but I’ve no idea why Jonathan Rosenbaum loves it so much. The #27 film of 1994. Pillow Talk – Maybe Doris Day needed a great director to be hot. She was great with Hitchcock and Frank Tashlin, but fairly lame here. Michael Gordon directed, he’s the grandfather of Joseph Gordon-Levitt. The #16 film of 1959. Murder! 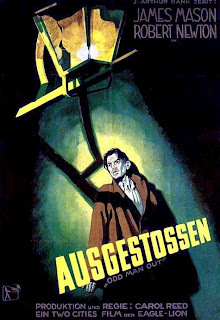 – Early Hitchcock film in which a juror begins reinvestigating the titular crime after they’ve decided to convict. It’s alright, not the greatness of The 39 Steps of The Man Who Knew Too Much, nor as revolutionary as Blackmail, but Hitchcock’s always entertaining. The #5 film of 1930. A Farewell To Arms – It’s been almost a decade since I read the book, which I liked, and I think this is a decent adaptation of it. Gary Cooper and Helen Hayes star, Frank Borzage directs. Borzage’s an interesting auteur who’s film’s aren’t as available as they should be. I certainly need to see more of them. The #7 film of 1932. Kiss Me Kate – Another Rosenbaum favorite that on the whole escapes me. There’s lots of fun unpacking the various levels of adaptation, and some of the Cole Porter songs are great (“Always True To You” was stuck in my head for days), but other than Ann Miller (who really stands out) the cast is mediocre. Kathryn Grayson and Howard Keel? Bleh. The #11 film of 1953. The Tomb Of Ligeia – Corman + Price + Poe = always awesome. Robert Towne (Chinatown) wrote the screenplay. Price and his new wife are haunted by his dead wife, colorful horror ensues. The #15 film of 1964. 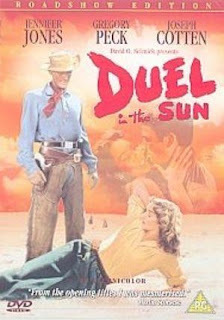 Duel In The Sun – Pretty colors, overthetop melodrama, casual racism coloring an anti-racist plot, Gregory Peck as the bad guy versus Joseph Cotton and Jennifer Jones. Lots of fun. The #11 film of 1946. One Mysterious Night – Boston Blackie B movie directed by Budd Boetticher. Not a fan of this series about an expert thief, and Boetticher’s not yet learned how to be awesome. A couple nice shots, but on the whole, just not very good. The #13 film of 1944. Too Late The Hero – Pretty decent WW2 film from Robert Aldrich. Michael Caine and Cliff Robertson lead a group of soldiers chased across an island by the Japanese. Good acting, lots of suspense, some fine action and a killer premise for an ending. The #8 film of 1970. Flying Down To Rio – The first pairing of Fred Astaire and Ginger Rogers only comes alive when they’re together, and since their the supporting cast, that doesn’t happen nearly often enough. Otherwise, it’s a generic 30s musical comedy. The #9 film of 1933. One, Two, Three – Late Billy Wilder film starring James Cagney as a Coca-Cola exec in West Germany. There’s way too much setup, but once it all starts clicking for the zany conclusion, the film nears greatness. Cagney’s wonderful with the hyperactive dialogue. The #12 film of 1961. The Merry Widow – Perfectly pleasant Ernst Lubitsch adaptation of the famous operetta starring Maurice Chevalier and Jeanette MacDonald. I’m generationally disposed to despise this kind of singing, which limits the enjoyment somewhat. The #7 film of 1934. The Marrying Kind – Judy Holliday and Aldo Ray star in this George Cukor film about a divorcing couple who flashback on the history of their relationship. It’s alright, lots of drama and not as much comedy as you’d expect from Cukor and Holliday. Ray really kept freaking me out because he sounds exactly like Super Dave Osborne (who you can now see on the new season of Curb Your Enthusiasm). The #18 film of 1952. Morocco – Josef von Sternberg film which for some reason a lot of people I respect think is one of the very greatest films of all time. I must have missed something. It’s really good, don’t get me wrong. Gary Cooper’s an officer in the French Foreign legion who hooks up with cabaret singer Marlene Dietrich. Romantic tragedy, some self-sacrifice and Adolphe Menjou clutter things up, but in the end there’s a happy, apparently quite anti-feminist (?) conclusion. I like the young Cooper better than the old one, and I always like Dietrich. The #1 film of 1930. Never So Few – generally generic and mediocre WW2 film by John Sturges, notable pretty much just for it’s remarkable cast: Frank Sinatra, Paul Henreid, Steve McQueen, Dean Jones, Gina Lollabridgida, Charles Bronson, Brian Donleavy, Peter Lawford and George Takei. The #15 film of 1959. The Bachelor And The Bobby-Soxer – Screwball comedy that isn’t very funny, though it stars Cary Grant as a celebrity caught between two sisters: teenaged Shirley Temple and judge Myrna Loy. Irving Reis is no Howard Hawks. The #8 film of 1947. Come And See – The only one of the Copeland poll films I hadn’t heard of is this Soviet WW2 film directed by Elim Klimov. It’s very striking to look at, stars real and becomes increasingly surreal until the last 45 minutes or so, which are an absolutely brutal account of the destruction and murder of a village by some subhuman Nazis. A horrific film. The #13 movie of 1985. Letter From An Unknown Woman – Joan Fontaine stars in this Max Ophuls film about a woman’s lifelong obsession with a philandering pianist who doesn’t know she’s alive. Beautiful, heartbreaking, and darkly tragic as we realize just how delusional the poor girl is. Ophuls masterly fluid direction is at it’s best. This makes three of his films I’ve seen, and I know I’ve yet to scratch the surface of their greatness. The #4 film of 1948. 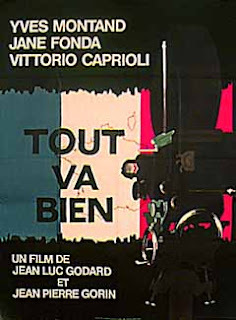 Tout va bien – The most famous of Jean-Luc Godard’s Maoist films, Jane Fonda and Yves Montand star as a couple who get caught up in a strike at a sausage factory. There’s lots of lecturing about horrible working conditions, but all filmed quite beautifully with long two-dimensional tracks across a cut away set (it’s like the side views of the boat in Life Aquatic). Voiceovers deconstruct the filmmaking process (it’s really a lot of fun) in the beginning. In the middle, the actors deconstruct their relationship. And in the end, Godard reflects on the ultimate failures of 60s radicalism. At least that’s how it seemed to me. I wonder if he saw it as quite so elegiac at the time. Endless 2D tracks across a supermarket riot are really cool. One of the cooler tidbit I’ve learned reading Colin MacCabe’s Godard biography: Fonda tried to back out of the film saying she had “evolved” and was no longer working with men. Hilarious. The #7 film of 1972. Superbad – I’m certainly no running-time Nazi, the the Judd Apatow Group seriously needs to tighten up their films. This is getting ridiculous. A fine one night coming of age story in the tradition of American Graffiti, Dazed and Confused and Can’t Hardly Wait. Some funny moments, but nothing revolutionary. Le Jour se lève – The great Jean Gabin stars in this Marcel Carné proto-noir about a murderer surrounded by police flashing back on the romantic folly that lead him there. Turns out it’s a typical love triangle intersection caused almost entirely by people refusing to act rationally and actually tell each other what’s going on, the silliness of which kinda deflates the drama. It’s a good premise which Carné directs well, and Gabin’s pretty terrific. The #13 film of 1939. 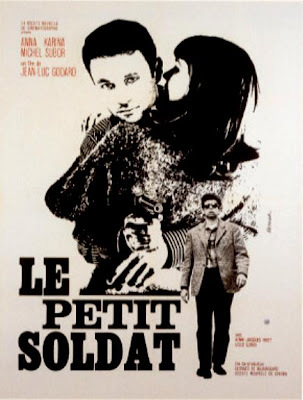 Le Petit soldat – Jean-Luc Godard’s second film, and the first with Anna Karina, it was banned for three years by the French government for its political content. A young French soldier gets captured by some Algerian rebels and is tortured in an apartment. The low-key torture sequence (matter of fact, but still pretty horrific) is paralleled by an earlier extended sequence of the soldier photographing (and romancing) Karina. Anticipates The Battle Of Algiers in style. The #10 film of 1963. Eastern Promises – The last thing I expected from this David Cronenberg Russian Mafia in London film was a generic Hollywood thriller, and unfortunately, that’s what I got. Fine acting from Viggo Mortensen, Naomi Watts and Armin Mueller-Stahl isn’t enough to overcome the cliché that is the final 30 minutes or so. Very disappointing. Les Carabiniers – The third Godard film of 1963 is a strident anti-war film about a pair of know-nothing nobodies who get caught up in a generic war in order to commit all variety of crimes and earn about the world. At times quite funny, it’s also quite serious about the stupidity of all kinds of war. Godard includes actual soldier’s letters home as intertitles throughout the film. I wonder if Ken Burns has ever seen this? The #12 film of 1963. 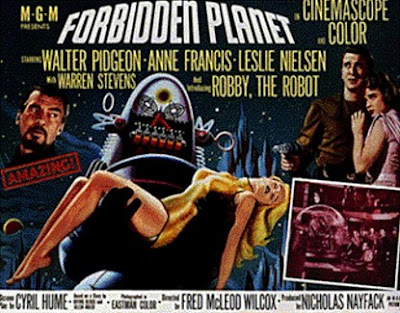 Forbidden Planet – Seen now, after all the sci-fi it has since influenced, it’s tough to watch this version of Shakespeare’s The Tempest (in Space!) as anything other than a long episode of Star Trek with a shot of Lost In Space and a dash of The Black Hole. But it’s a surprisingly pretty film, with decent enough performances by Leslie Nielson and Walter Pidgeon. Anne Francis is quite pretty as well. The #14 film of 1956. “Forbidden Planet” is awesome. Not only because it is the inspiration for the Melvins song “the Fool, the Meddling Idiot”… but that sure helps. Just saw _Morocco_ yesterday. Must agree: what’s the there there? Her legs? Or her eyebrow?